← Airframe specific refrence pages. One of the most read stories I have put here is this one: Pietenpol review in pictures, 15 more Corvair powered Piets. Over the last months, it has had several thousand page reads. While I am working on a reference page for 601/650s, I thought I might put together a quick review in pictures of some 601’s and 650s. Over the years we have had more than 70 of them fly, but here is a quick look at 20% of them. I selected these because they I wanted to show how many people use them for trips to places far away. I have had people who should know better say to me “you need a Bonanza or a 210 to fly cross country” Claims like that are just ridiculous. First, a 601/650 gets more MPG than those planes, and second I would gladly fly a 601/650 with their gentle approach and touch down speeds into many small strips that you would be a fool to try in many traditional GA “Cross Country” planes. Frankly, If I am going to fly around the country to enjoy myself, I am not myopically focused on is seeing how quick I can get the experience over with. The 601/650 has a very useful combination of reasonable speed, small strip capability, good range and both baggage volume and weight capability. This gives their builders access to a lot of good adventures, as evidenced by many of the photos below. 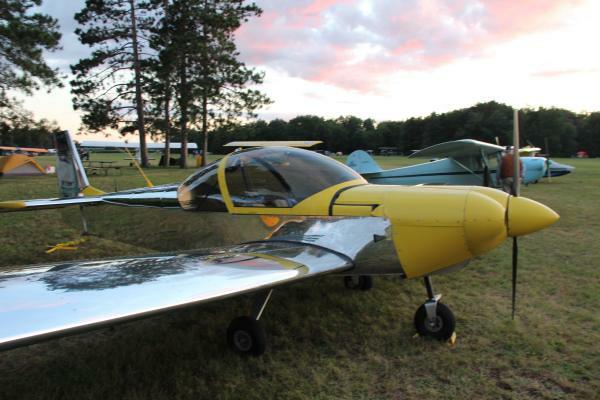 Above, Pat and Mary Hoyt’s 601XL (with 650 canopy) at Brodhead WI, 2013. The airport has clear approaches, but is a fairly short grass strip. They also flew to Oshkosh and the Zenith open house in MO this year. 2,700cc Corvair power. Above, Brodhead 2012, Ron Lendon of MI with his 601XLB, plans built, 2,850cc Corvair. Ron also flew to Oshkosh, and this year flew to Sun n Fun in FL and to CC#25. Above, Sun n Fun 2006, in the Zenith booth. The above photo shows Phil Maxson standing by his 601XLB along with Gus Warren. Phil’s plane has flown back to FL many times and to several Corvair Colleges including #10 and #24. Corvairs and Zeniths are a long proven combination. 2,700cc Corvair power. Above, the Zenith booth at Oshkosh 2007. Dr. Gary Ray of MI and his 2,700cc 601XLB. 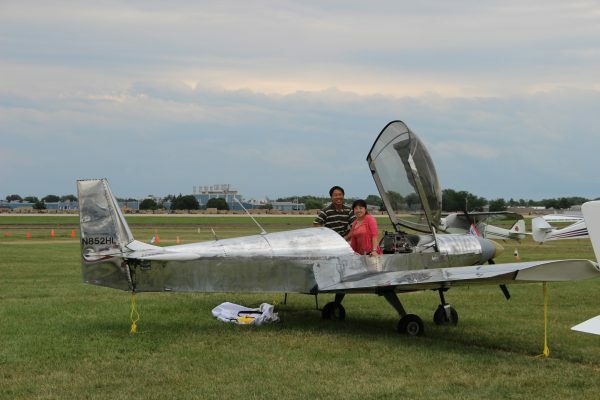 He has also flown the plane to CC#20 and to the 2011 Zenith Open house in MO. Above, the Zenith booth at Sun n Fun 2013. Lynn Dingfelder’s 601XLB with 2,700cc Corvair from PA. The plane has also flown to Corvair Colleges #20 and #25. Above, Oshkosh 2011. In the above photo, Woody Harris’ 2850cc Zenith 601XLB. This plane is based in CA but has flown all the way to NC and back, and has been the full length of the west coast. I am pretty sure it has flown in 25 states, and that is mostly the big ones out west. Engine is a 2,850cc Corvair. Plane has 340 hours on it. Above, Charles Leonard’s 601XLB in Punta Gorda FL. Engine is a 2,700cc Corvair. Plane finished and flying since 2009. 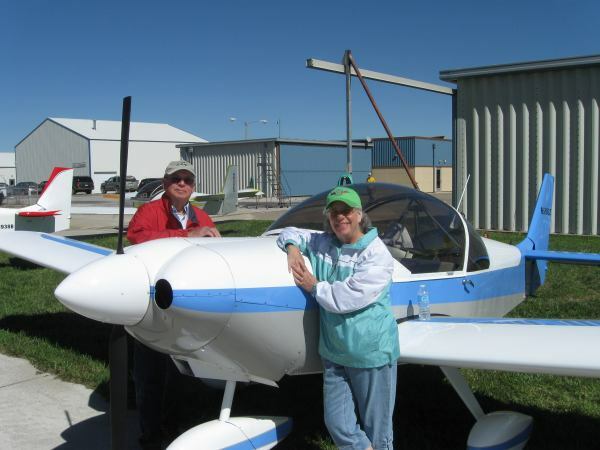 Above, Shayne & Phyllis McDaniel with their 650 at the 2012 Zenith open house. This aircraft was seen by thousands of builders at its Oshkosh debut, it displays outstanding workmanship. 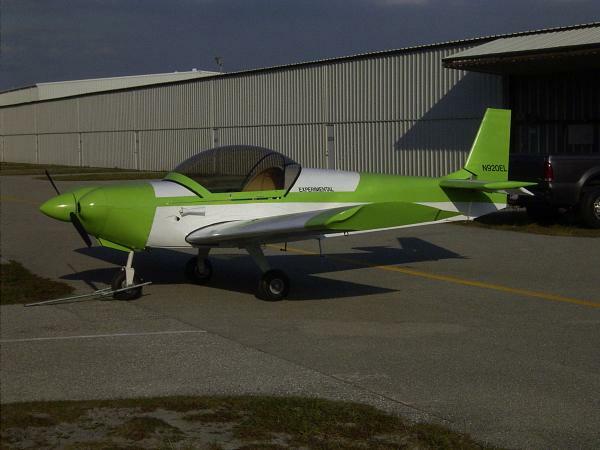 It was the first amateur built 650 on the FAA registry. Engine is a 2,700cc Corvair. Shayne stands in front of their second Corvair powered Zenith, a 601XLB with another 2,700cc Corvair. They are both skilled pilots and they like having ‘His and Her’s ‘ Zenith’s. It is a sure sign that you line a combination when you build a second one. Above is Andy Elliott’s 601 XL tailwheel aircraft, now converted to 3,000cc Corvair from an older 3,100 Corvair. The plane is from AZ, and it has more than 500 hours on it. It has been all over the West, and flown as far east as Oshkosh. 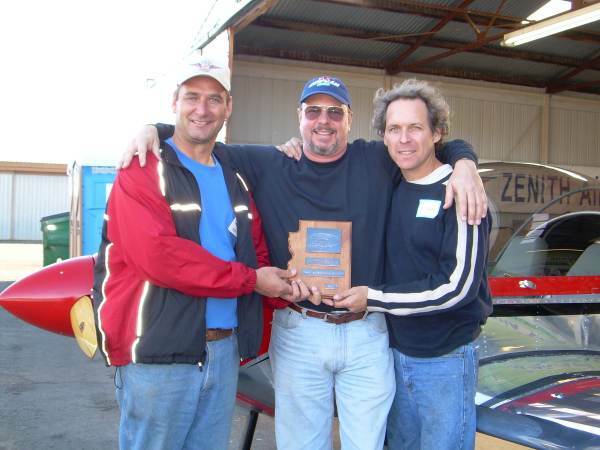 Above, L-R, Michael Heintz, Rick Lindstrom and myself at Quality Sport Planes in CA. Award is ‘best engine’ from Copper State AZ show. Michael was local host for Corvair Colleges #10 and #11, Rick was local host for #13 and #18. 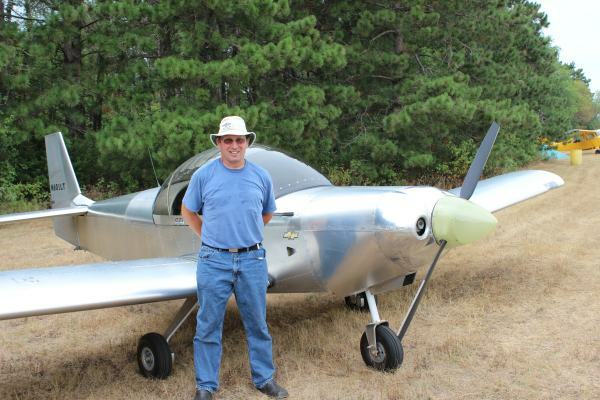 Rick’s 2,700cc XL was built in our hangar in FL, and has flown it Southern CA and all the way up to Arlington WA, covering 3 corners of the lower 48. Above, Gary Thomas’s 2,700cc 601XLB at Corvair College #16 in SC. Gary is formerly of Florida and now from North Carolina. The plane was also flown to CC#21. Above, photo taken at CC#16 in SC. Scott Thatcher’s 601 XL. This was the first College to which Scott flew. He has also flown the plane between FL and NC, and flown it back to CC#21. Above, I stand outside at the 2009 Zenith Open House with David Coberly from AR, and his 601 XL. First time I had seen the plane or met the man. Outstanding craftsmanship. Above, Dave Gardiea and his 650. 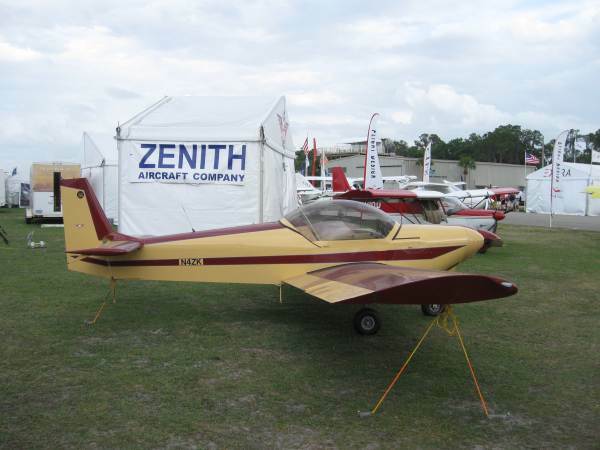 Aircraft has flown to Oshkosh and the 2012 Zenith open house. Engine is a 2,700cc Corvair. Above, Louis Leung of MA and his 601XLB at Oshkosh 2013. Engine is a 2,700cc Corvair.